This theme has really taken on a life of its own! 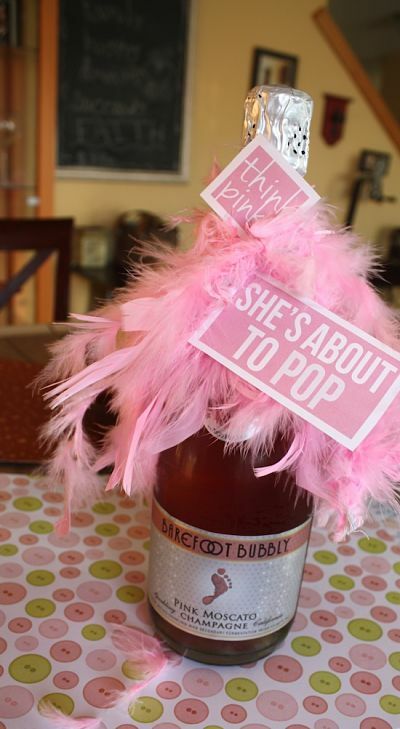 It is so much fun to plan a "About To Pop" baby shower because the creative possibilities are endless! 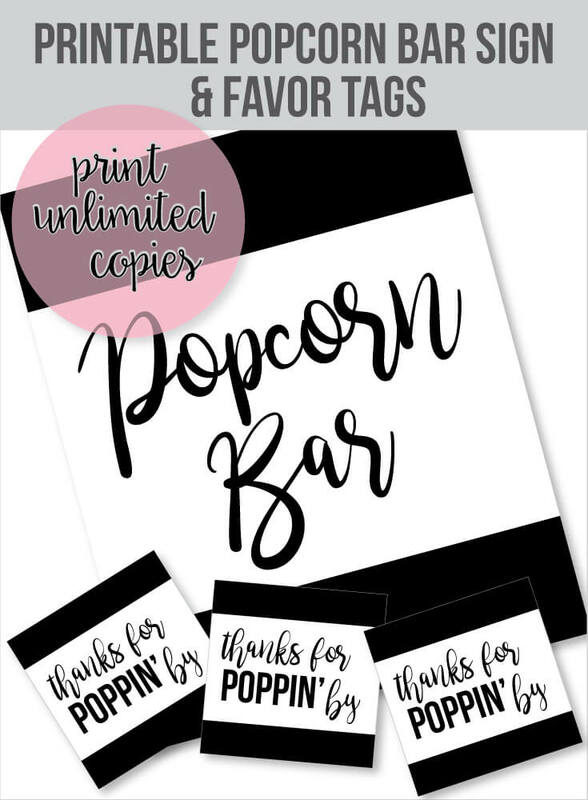 (Be sure to read below - I designed some free favor tags for you!) 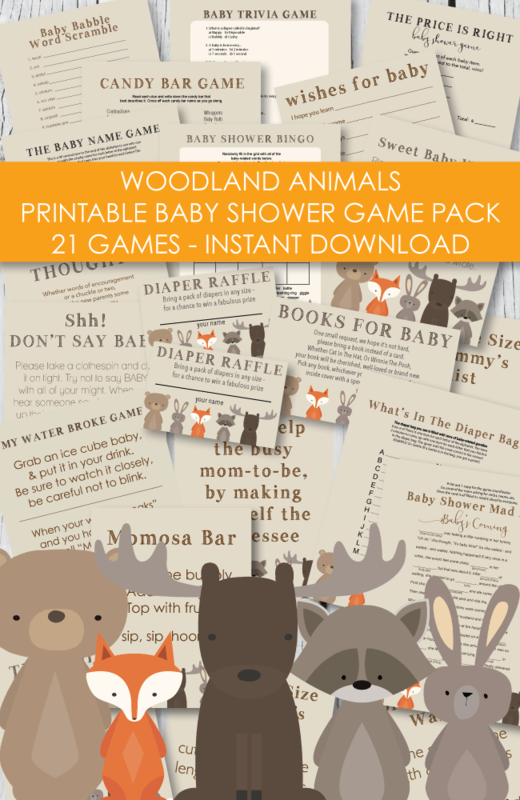 Start out by giving away a "Movie Gift Basket" to one of the big baby shower prize winners! Holy moly! Isn't this just the most clever idea you have ever seen!? Talk about creative - easy - and best of all ... affordable! 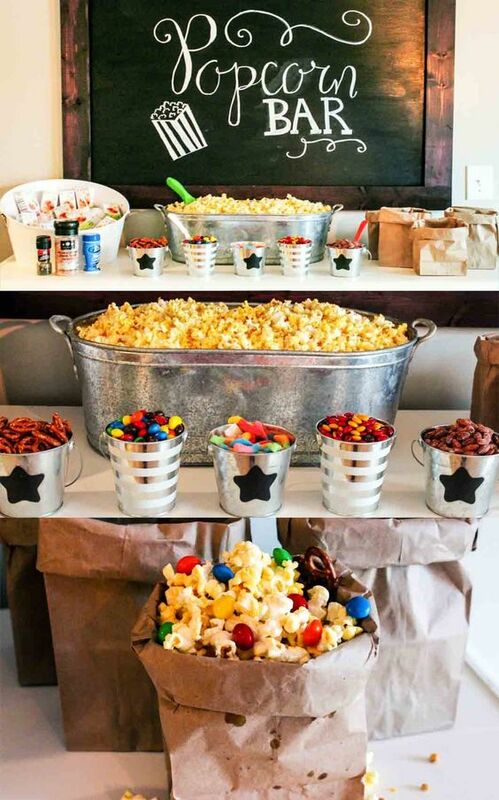 Let guests scoop up a bag of yummy popcorn and add all of their favorite ad-ins! Popcorn toppings - cheese powder, salt, pepper, garlic salt, etc. 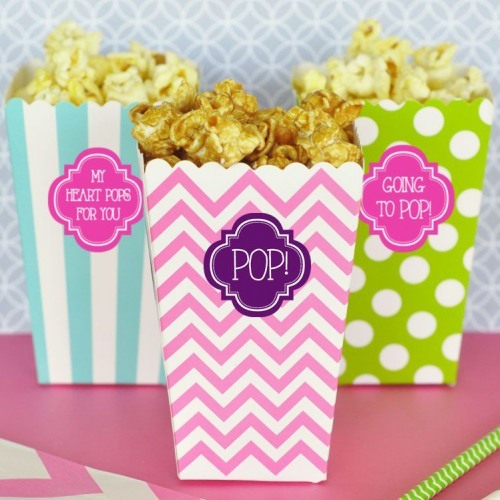 You can have paper bags or popcorn tubs for guests to fill up and take home as baby shower favors! 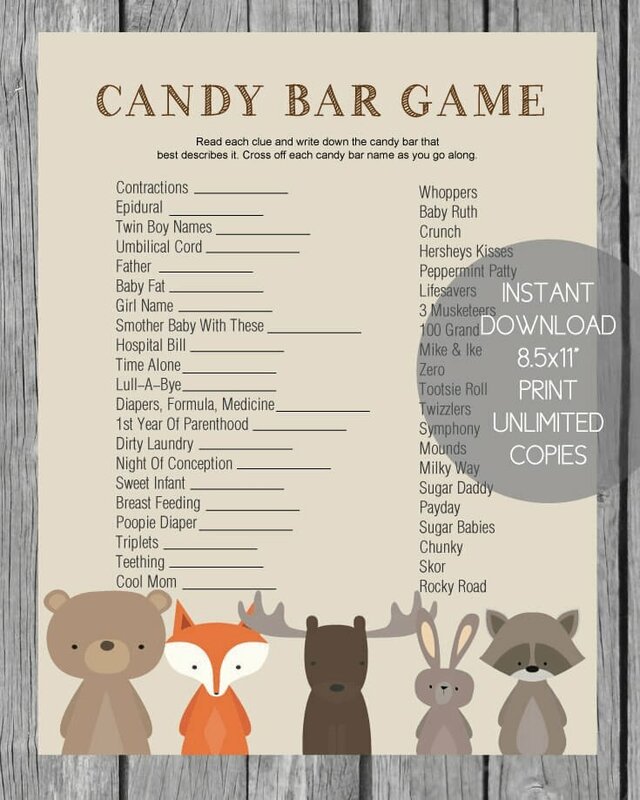 I like to wrap a related DVD ("Knocked Up" or "Baby Mama"), one individual bag of popcorn (they have them personalized now with a pregnant mommy silhouette that says "about to pop", a 20 oz bottle of soda (pop), some Blow Pops or Tootsie Pops (above,) and a bar of candy (may include a personalized wrapper with the theme of the shower) in a gift basket wrapped in cellophane. For the grand prize, you can include a DVD player often on sale at Wal Mart for $29. 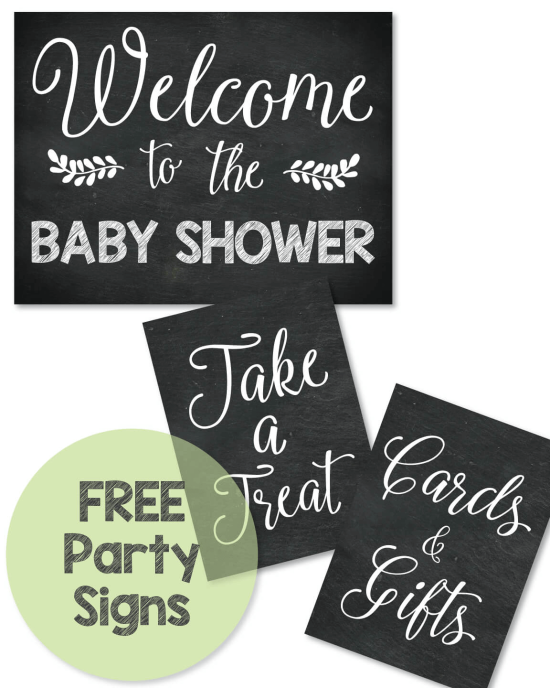 These make great baby shower prizes and favors! I found the cute popcorn jelly bean favors here. 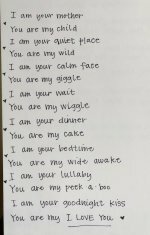 Printable "She's About To POP"
Download and print from home! 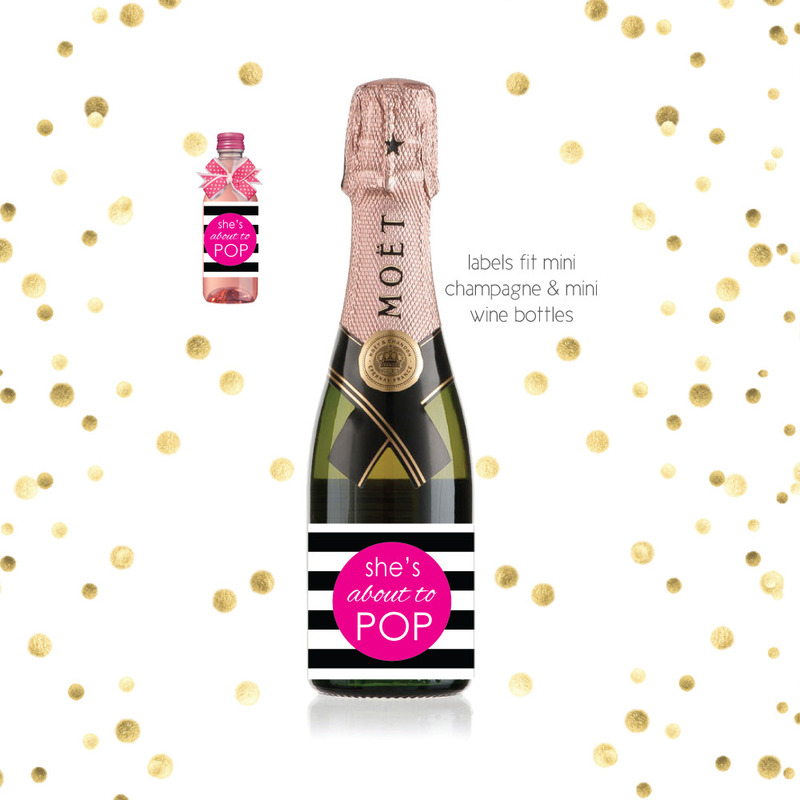 Attach to Blow Pops, Popcorn Bags, Izze Sparkling Water or Jones Soda and you have a cute and affordable favor! "I bought Tootsie Pop Lollipops and covered them with tulle and attached a gift favor tag with ribbon that read Look Who's Gonna Pop!!! I also included the mommy to be name and the date of the baby shower. You can also do "Guess Who's Gonna Pop?" 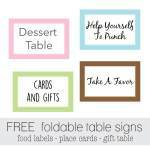 They were easy to make and affordable"
This is such a great idea! 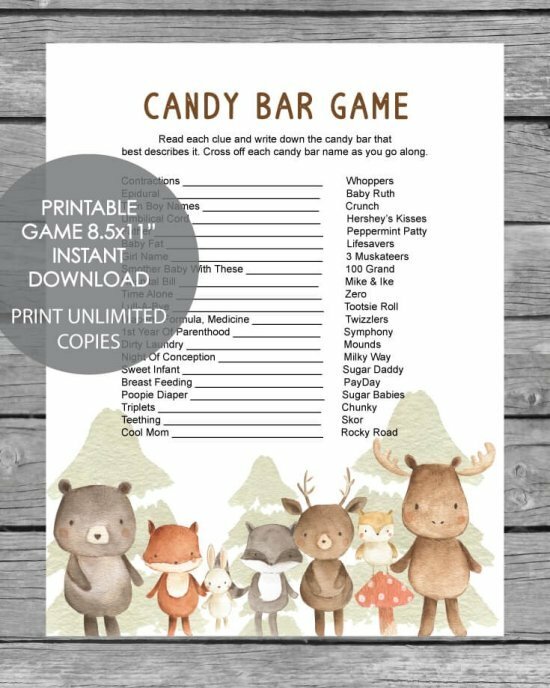 A way to add to this would be to buy a Styrofoam cone (tree shaped) and spray paint it to match the color of the baby shower theme. After it is dry poke lollipops into the tree and add to the food table. Add a cute sign saying (mom's name) Lolli"POP" tree! To add to this even more, mark the bottom of one or two of the lollipop sticks before inserting them into the tree. When guests arrive have each guest pick a lollipop. The ones who grab the colored stick lollipops win a prize! 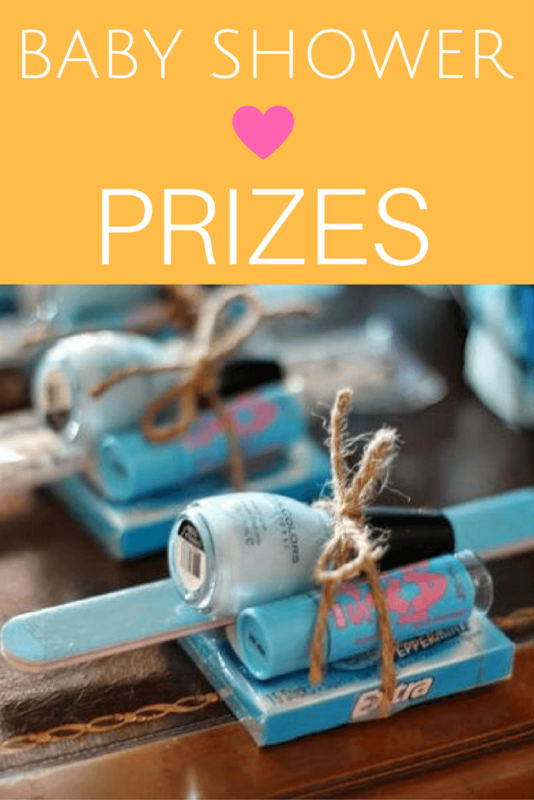 • The favors were bright colorful bottles of nail polish that had cute favor tags saying "Here is a POP of Color For You"
I love this baby shower theme - it really lets you get creative and have fun with the planning! This theme is so much fun! 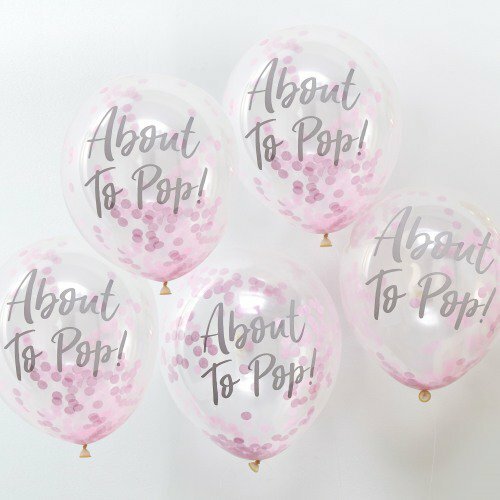 I recently threw a baby shower for my best friend Lauren and she wanted the "About to Pop" theme! She actually found this site and referred me to it. I bought the cute About to Pop theme pack and it was wonderful! Everyone loved all of the decorations, games and favors/prizes! We also played a fun game where I handed everyone a piece of Hubba Bubba bubblegum and we had a bubble blowing contest! Whoever blew the biggest bubble won an old fashioned popcorn maker. 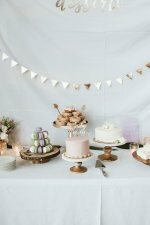 My best friend loved the shower and I just wanted to take a minute to say thank you for all of the cute ideas! 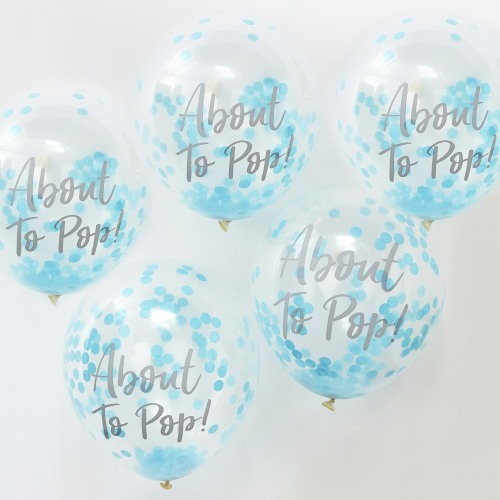 For baby shower decorations you can have several balloons floating around with cute tags attached to them saying "POP"
Have a large cylinder glass vase filled with colorful gumballs and include a scoop and little bags for guests to scoop out gumballs and fill their bag to take home as a favor! 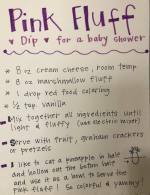 This is a great idea if children are attending the baby shower! Serve a large bowl of popcorn with M&M's mixed in with it. We have a ton of favor tag ideas and designs (including more "She's About To POP" designs) - The first picture above is a fun baby shower prize or favor idea - take a regular sized bottle of champagne, add some feathers or any embellishments to it - (this is a pink feather boa from a craft store) - print out these favor tags and add them to the bottle! Guests will love receiving this as a prize or favor! 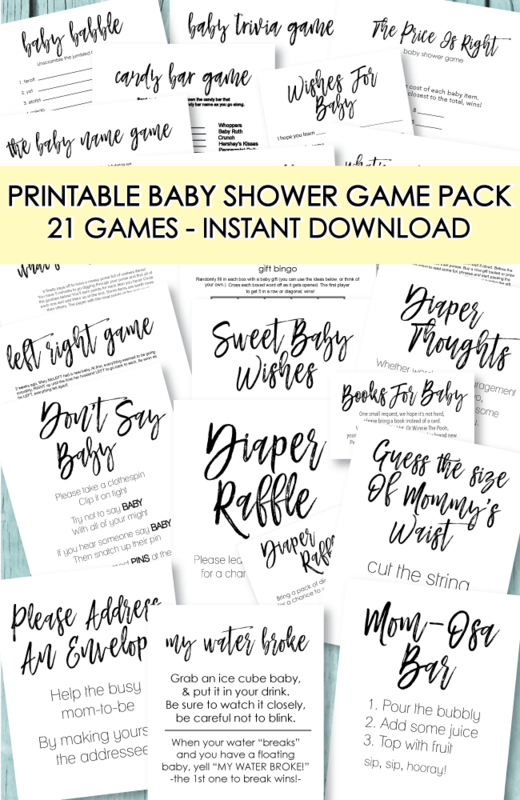 The 2nd idea is to print off these mini champagne labels onto sticker paper - wrap around mini bottles of champagne and you have instant baby shower favors! Tie a cute striped or polka dot straw to each one to jazz them up a bit!